This release adds the ability for users to sign or draw on photos taken in photo booth mode - ideal for "magic mirror" photo booths. It also adds the option to create MP4 copies of animated GIFs and to share animated GIFs or MP4 movies by email, text, Facebook or twitter. New touchscreen actions added for increasing or decreasing the number of copies to print in the print confirmation screen. The print confirmation screen now uses different backgrounds according to the number of copies e.g. confirm_printing_1.jpg, confirm_printing_2.jpg etc. This release adds support for sharing photos by texting or Twitter. It also adds support for creating animated GIFs (and MP4 movie copies) in photo booth mode and to share animated GIFs via email, text, Facebook and Twitter. This release adds the ability to scan subfolders for images and to specify the file types (JPEG, GIF or movie files) to display. It also adds the option to use "printer-friendly" images stored in the prints subfolder for printing and the displayed images for sharing for example an animated GIF can be displayed in Breeze Kiosk and shared via email, text, Facebook or Twitter and a printable version saved in the prints subfolder for printing. Animated GIFs can now be posted to Facebook by automatically hosting them on Giphy.com and posting the URL to the user's timeline. This release adds support for the Canon EOS 5D Mark IV. It also adds the ability for users to sign or draw on photos taken in photo booth mode - ideal for "magic mirror" photo booths. Improved control over camera settings in photo booth mode to make it easier to setup a photo booth that offers both normal photos and video capture. New touchscreen actions added for increasing or decreasing the number of copies to print in the print confirmation screen. The print confirmation screen now uses different backgrounds according to the number of copies .e.g confirm_printing_1.jpg, confirm_printing_2.jpg etc. This release adds support for the Canon EOS 5D Mark IV, adds a new multi-view mode and enhances the Multi-Camera Animator utility. The new multi-view mode displays the most recently taken photos or previews from each camera in a grid in the main window. The display can be cleared before taking a set of photos so that the download process can be monitored and any problems with cameras not being triggered or failing to download photos easily identified. The Multi-Camera Animator utility has been enhanced to automatically create MP4 videos as well as animated GIFs. The animated GIF creation now supports indexed color which gives more detailed results. A menu option to launch the Multi-Camera Animator has been added to the File menu of DSLR Remote Pro Multi-Camera to make it easier use. Please see this page for more information about the Multi-Camera Animator. This release enhances support for animated GIFs to give better colors, to place the photos GIFs within a frame when capturing animated GIFs in video mode (see the example below), to share the animated GIFs via email, Facebook and Twitter and to automatically create MP4 versions of the animated GIFs. Improved green screen setup in photo booth mode allows different settings to be used for the live view display and for the photos to make it easier to use green screen with flash. The new simulated camera option makes it possible to test the photo booth operation without having a camera connected. The option to show the mouse cursor in photo booth mode also makes it easier to test touchscreen configurations without requiring a touchscreen or to operate the photo booth only using a mouse. The reprint selection screen has been enhanced to allow multiple photos to be selected and the number of copies to print to be specified. The reprint selection screen settings can now be adjusted directly from the program. An animated GIF showing the new improved colors for GIFs and the ability to place the photos within a frame in video booth mode. Please note: DSLR Remote Pro for Windows v3.5.4 beta 1 is a beta release which has not been as thoroughly tested as a full release. Also, some features and settings in the beta release may change in the full release. The full release will be available in early October. This release adds support for sharing photos via Twitter and MMS (US and Canada only) or SMS via Twilio.com. It also adds support for automatically creating animated GIFs complete with optional title pages and overlays e.g. Animated GIFs can be viewed using Breeze Kiosk where they can be shared via email and text or uploaded to Twitter. This release adds support for the Canon EOS 1300D/Rebel T6, Canon EOS 80D and Canon EOS-1D X Mark II. This release also includes a new Multi-Camera Animator utility which automatically creates animated GIFs from the photos downloaded using DSLR Remote Pro Multi-Camera. The photos are adjusted for pan, tilt, roll and zoom to compensate for camera alignment errors and can be cropped to remove unwanted areas. The photos can also be automatically chroma-keyed (green screen or blue screen) and optional overlays added. Please see this page for more information. It also adds a new manual print layout option to make it easier to use a color laser printer and business card cutter to create flip books. Maintenance release to fix a problem with uploading to Facebook and Twitter which affected v3.5.3. This minor update fixes a problem with video playback breaking up on some computers. It also enhances animated GIF support by allowing multiple title pages so that short animations can be displayed in addition to the photos e.g. 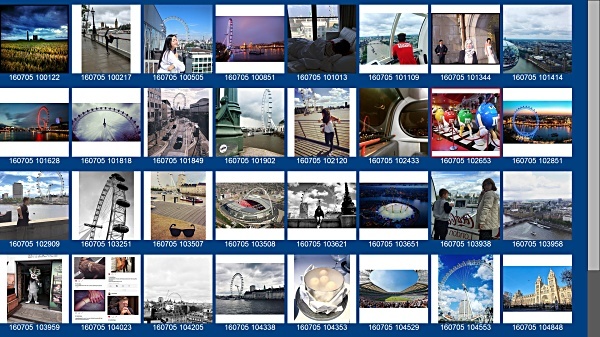 Grid layout display option which displays a grid of thumbnails to make it easier to find a photo when a large number of photos are available. Touching the thumbnail zooms to a full screen preview with icons for printing and sharing. This release enhances support for animated GIFs in photo booth mode by adding the ability to position the photo within the GIF so that an animated border can be added. It also allows multiple overlays per frame so that more advanced effects can be used when creating animated GIFs. Photos are now rotated before being added to the animated GIF when the camera is in portrait orientation. This release fixes a problem with DSLR Remote Pro v3.5.1 where the live view becomes dim during the count down when using external flash mode. It also includes a workaround for a camera firmware issue which causes occasional AF errors when the camera is set to manual focus. Please note: There is a problem with external flash mode in this release which has been fixed in v3.5.2 (see above for details). Breeze Systems hereby gives notice that DSLR Remote Pro for Mac will be withdrawn from sale on July 1st, 2016. Customers with valid licences can also switch to the Windows version, DSLR Remote Pro for Windows, by purchasing a DSLR Remote Pro for Windows upgrade license. DSLR Remote Pro for Windows will run on a computer running Windows 10, Windows 8, Windows 7 or Windows Vista. This is our first price change in more than five years; Breeze continues to offer great value for money, one year's free upgrades with licenses which do not expire. The price of upgrade licenses will also increase, but will still cost around half the price of a full license.